Enough strips for 14 Treatments – each sealed foil pouch has 2 strips (one for upper and one for lower teeth) Total of 28 strips, 2 week supply. Perfect teeth whitening on the go. Very easy to use. 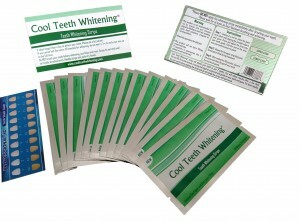 You can have your teeth whitened in just 14 treatments. Mouth trays and gel tubes are great for home but strips are easy to apply wherever you are. Teeth whitening strips travel with you. Perfect quick whitening before a night out or an interview. You will start seeing results after your first application, but the real difference will be at the end of 14 treatments. Consuming coffee, tea, wine etc. between treatments will set you back a little. For best results stay away from staining foods and drinks during your 14 treatment period. Store the teeth whitening strips in a cool place. Do not handle the strips with wet hands. Do not use the strips immediately after brushing your teeth. Rinse and brush your teeth after each treatment. 100% enamel safe – will not damage your teeth enamel. May cause brief teeth sensitivity. 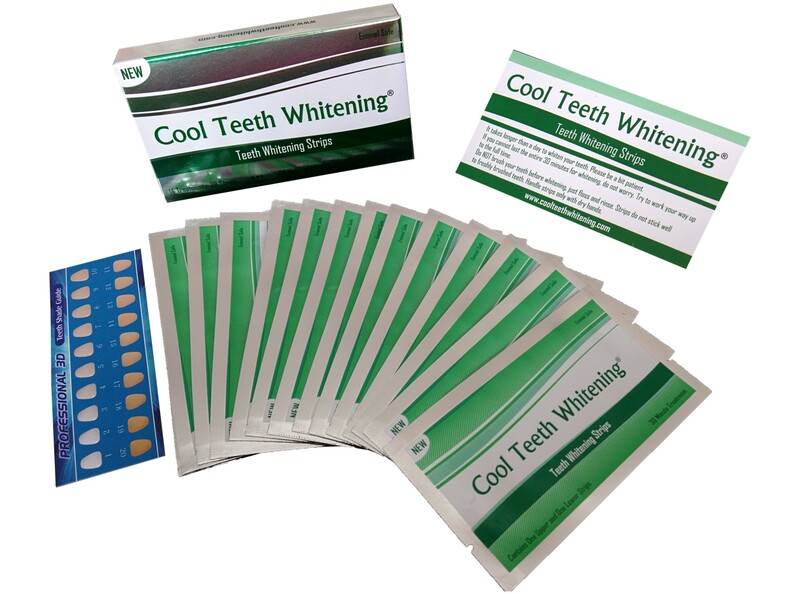 Use the color shade chart to compare day 1 and day 14 to see noticeably whiter teeth or your money back. 1- Cool teeth whitening strips should be stored in a cool place not the freezer. 2- Please do not handle strips with wet hands. 3- Strips stick to your teeth better if your teeth are dry. Pleasery wipe your teeth with a paper towel before applying the strips. 4- Do NOT use the strips immediately after brushing your teeth. Just floss and rinse your teeth very good before whitening. If you have already brushed your teeth, please wait 30-40 minutes before whitening. Strips do not stick well to freshly brushed teeth. Brush and rinse after whitening. 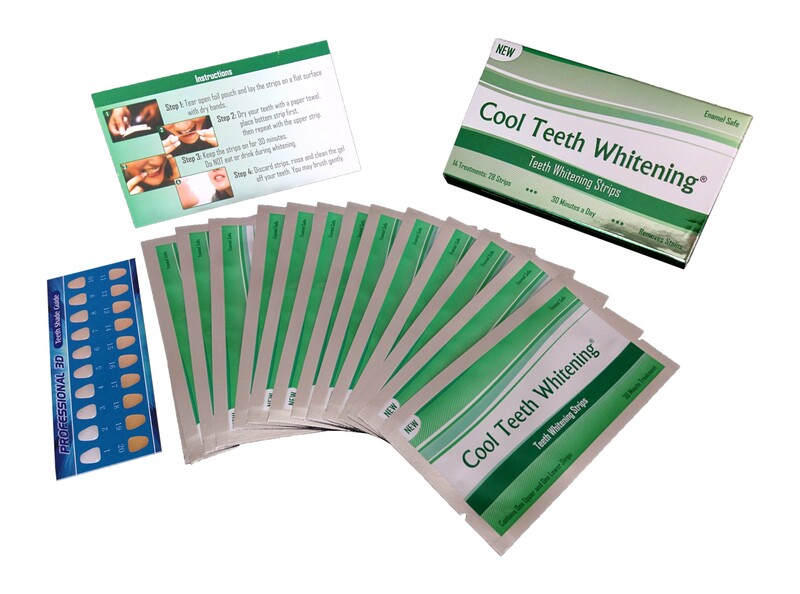 You will receive 14 sealed pouches of 2 strips (one for upper and one for lower teeth) Total of 28 strips, enough for 14 treatments. You can do upto 2 treatments within 24 hours. Mini sealed aluminum pouches are perfect for teeth whitening on the go. You will also get a free shade guide so you can see your progress. We are confident that you will start seeing results after the first treatment but the real difference will be at the end of 14 treatments.For longer lasting results, avoid staining food and drinks between treatments. 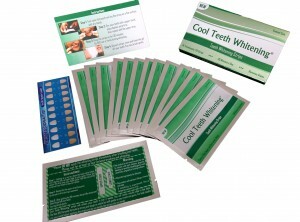 According to the teeth whitening experts, the first 24-48 hours after teeth whitening is critical. After the whitening process, the pores or dental tubules on your teeth are open and they are very susceptible to staining. Handle strips only with dry hands. Step 1: Fit lower strip – apply gel side against your teeth and fold over the remainder to back of teeth. Step 2: Fit the upper strip. Clean your mouth carefully and clean the gel off your teeth.